It is the adjoining house of the old school Kirmutscheid, which is protected both inside and outside. The year of the school is dated 1829. 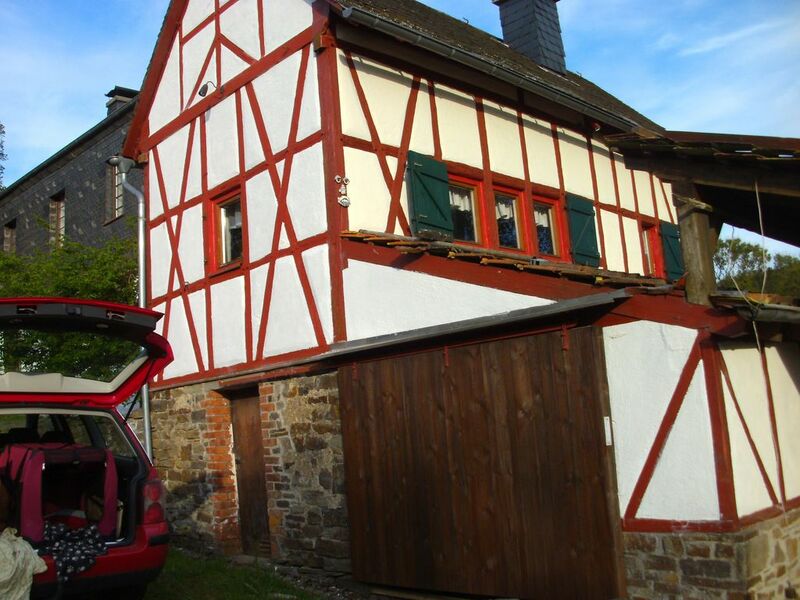 It is a small half-timbered house with terrace and plenty of space outside. On the ground floor are living room, kitchen with dining area, cloakroom, bathroom and storage room. On the upper floor is a bedroom with 2 single beds (each 1x2m) and a bedroom with double bed (160x200). The house is suitable for lovers of authentic, historical buildings and for nature lovers. If you are looking for modern comfort, here is at the wrong address. However, those who would like to trace life in the "good old days", which was not always so good, would be welcome. The width of the doors is less than usual, one of the doors measures only 50cm in width. The stairs up is narrow, but good to go. In the bedroom only height 175cm is guaranteed on the outer wall. The dwarf school is very nice for 2 people, good for 3 and still sufficient for 4 persons. The secluded location in the forest is ideal for hikers, nature lovers and Nürburgring visitors. The kitchen is equipped with cooker / oven, refrigerator, cooking water, coffee machine, toaster. You will find a dining service, a large number of cooking utensils and other kitchen equipment. In the living room, a sofa and 2 armchairs invite you to rest, the satellite TV receives the usual programs. Internet connection is not here, since not possible. Cell phone reception is better or worse received depending on the provider, SMS are always sent. The slope behind the house leads up to the Trierbach, which often leads to high water, but which can not rise up to the house. On the bank under the house is a barbecue place, where you can sit shaded and refresh yourself at any time in the river. The Wirftbachschleife trail leads directly past the house. The place next to the house is used by hikers as a point of departure for this tour. The entrance to the Nürburgring GP loop and the Welcome Center is 10 km away and can be reached directly via the B528 in a few minutes. The city of Adenau, through which the Nordschleife directly over the B528 in few minutes to reach. The town of Adenau, which runs through the Nordschleife of the Nürburgringe, is 6 km away and offers all shopping facilities. To Bonn it is 55 km distance, to Koblenz 68 km, to Spa Francorchamps it is 100 km. The border to Belgium is 46 km away. Especially dogs are welcome, there is a charge of € 10/3 days of stay. One more word about dealing with the house and the furniture: Since the house is protected on the inside and outside, it is important to place particular emphasis on its maintenance. The substance must not be damaged in any way, as alterations and replacement of these are not permitted. The furniture itself is not very sensitive and can not be damaged in normal use. Parties are not allowed, normal rest periods apply. Bookings are only possible for the current year, regardless of where the holiday calendar is displayed. The house itself is located in the middle of the nature conservation project Obere Ahr - Hocheifel and is surrounded by floodplains and waters.